Following this year’s sailings of the Thomson Celebration from Newcastle, Thomson Cruises will be bringing its newest ship, the TUI Discovery, to the UK in 2018, with sailings from both Newcastle and from Southampton. 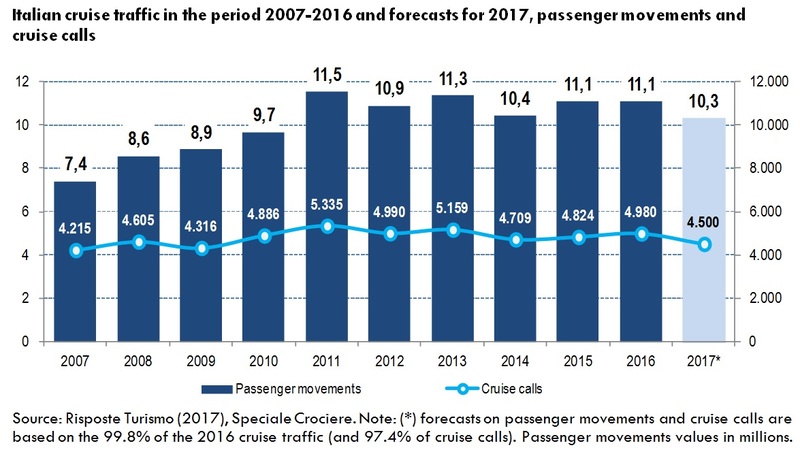 Meanwhile, Italian ports are forecast to lose traffic this year because of the smaller number of cruise offerings in the Mediterranean. And Hapag-Lloyd Cruises has announced the names Hanseatic nature and Hanseatic inspiration for its new 230-berth expedition cruise ships. Thomson Cruises revealed its 2018 program last week, which will see the addition of twelve new itineraries. The 69,130-ton Tui Discovery, which joined Thomson Cruises in 2016, will be based in Newcastle from May 2018, from where she will visit the Norwegian Fjords and cities including Stockholm, Tallinn and Reykjavik. The 33,930-ton Thomson Celebration is sailing from Newcastle this year, from June through September, offering a dozen 4 to 14-night itineraries to the Norwegian Fjords, Scandinavia and the Baltics, as well as Iceland. The last time Thomson Cruises offered ex-UK departures was in 2014. In September 2018, the Tui Discovery will move to Southampton where she will finish her summer sailing four itineraries: Fantastic Fjords, Baltic Treasures, European Experience and Seeking the Northern Lights. The new European Experience itinerary visits Germany, Belgium and France, with an overnight stay on board in Amsterdam, and Seeking the Northern Lights will take customers to the northernmost city in Norway to spot the phenomenon. The Thomson Celebration will move to Dubrovnik for the summer of 2018 where she will operate an adults-only program, which includes a no-sea day itinerary. Venetian Vistas now offers customers the chance to wake up in a new destination every day, spending full days in Bar, Korcula, Zadar, Venice, Trieste and Split. 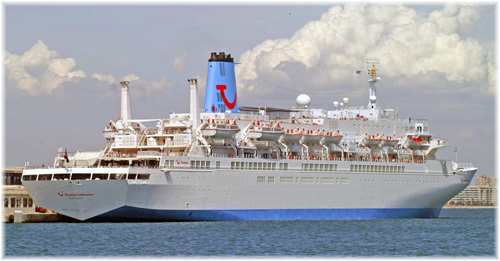 The Thomson Celebration will also sail two new itineraries, Sail Three Seas and Greek Mystique. Sail Three Seas will visit Valetta, Messina, Kefalonia, Igoumenitsa and Kotor, while customers choosing Greek Mystique can explore Chania, Piraeus (for Athens), Kalamata, Corfu Town and Kotor. 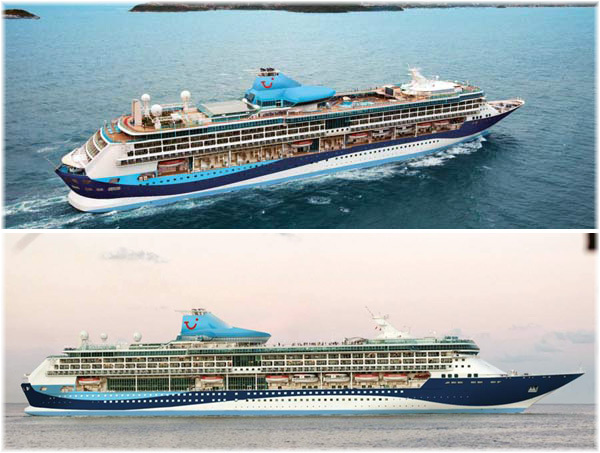 Making her debut in Corfu Town in summer 2018, the 69,130-ton Tui Discovery 2 will sail four itineraries in the Eastern Mediterranean, while the 53,872-ton Thomson Dream will be based in Palma de Majorca. 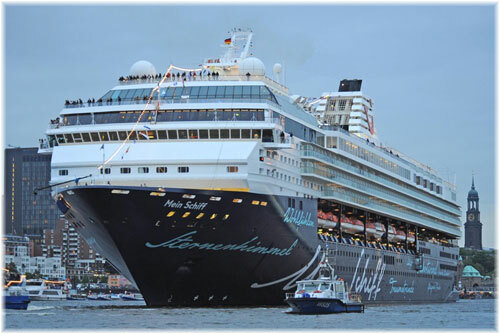 Thomson Cruises’ newest ship, the 77,713-ton Tui Discovery 3, currently sailing as Mein Schiff 1 for Tui Cruises will also be based in Palma. A drop of 7.1% is expected in the number of passengers embarking, disembarking or in transit at Italian cruise ports this year, to 10.3 million. This will be accompanied by a 9.6% drop in vessel calls to 4,500. This is primarily due to the lower number of cruise ships that will be passing through Mediterranean ports compared to last year, although Venice has also been affected by environmental politics. These are the findings published by research and consulting company Risposte Turismo in the seventh edition of its “Speciale Crociere” report on cruise tourism. The data have been obtained from forty-six cruise ports, which in 2016 accounted for 99.8% of cruise traffic and 97.4% of calls. The forecasts indicate that by the end of the year, there may be a reduction from four to three in the number of Italian ports handling more than a million passengers: Civitavecchia, (2.2 million -5.9%), Venice (1.4 million -11.4%) and Naples (1 million -23.4%). 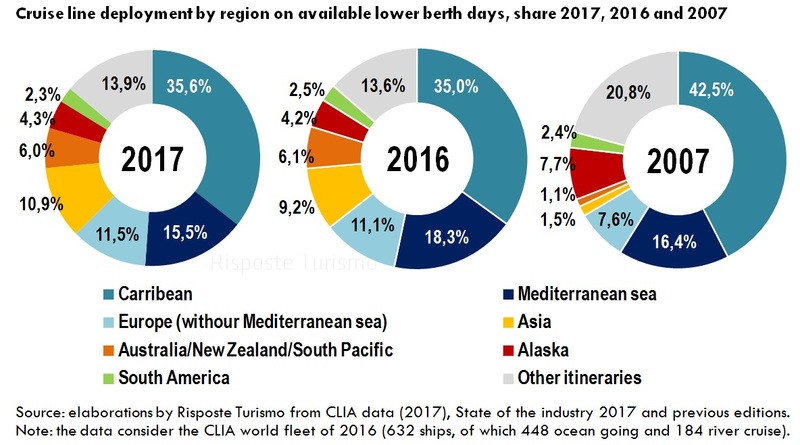 This analysis by Risposte Turismo shows that in 2017, the Mediterranean could register the lowest percentage of world cruise line deployment in the last 10 years: 15.5%, compared to 18.3% in 2016 and 16.4% in 2007. Forecasts for the current year show that the top spot is held by the Caribbean (35.6%), followed by the Mediterranean (15.5%) and non-Mediterranean Europe (11.5%). 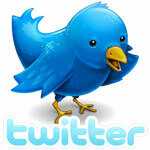 There is also now a 10.9% market share for Asia, which accounted for just 1.5% ten years ago. As for the number of cruise ports that welcomed cruise ships in 2016, Sicily remains top of the ranking at regional level, with 10 ports, followed by Liguria (9) and Campania (7). The full-year data for 2016 on individual ports confirm Venice’s position as Italy’s top turnaround port, with the largest number of embarking and disembarking passengers, totalling just over 1.4 million, followed by Civitavecchia, with about 847,000, and Genoa, with about 642,000 passengers respectively. For transit cruise passengers, top of the list is once again Civitavecchia with about 1.5 million, followed by Naples with about 1.2 million and Livorno with about 798,000. Risposte Turismo has been organising Italian Cruise Day, this year in its seventh edition and scheduled for October 6 in Palermo. Hapag-Llloyd Cruises’ new five-star expedition ships on order at the Vard division of Fincantieri will be named Hanseatic nature and Hanseatic inspiration, with the second word in lower case. They will carry 230 passengers, reduced to 199 in the Antarctic. Hanseatic nature will cater to the German-speaking market and Hanseatic inspiration to the international market as well.